Storm Voeten is the 12-year-old son of a printer, living in 1500s Antwerp. Martin Luther has written his 95 Theses and his ideas are a source of debate and division across Europe. That's also true in the Voeten household, where Storm's mother, a staunch Catholic, doesn't even want to hear Luther's name. But his father is interesting in learning more...and he's even willing to print Luther's ideas. The opening scene has Luther making his brief, appearance in the film. He's writing a letter, even as a squadron of soldiers is heading his way. The letter is entrusted to the care of an assistant to take to Antwerp. Though the events in this film are more of the "inspired by" variety, rather than purporting to be historically accurate, there is some real history here. Luther did send a letter to Antwerp. In the film the letter is a rallying cry against the Catholic Church, and a call to rely on Jesus alone. In real life, while we don't have the letter itself, other accounts make it sound as if it had an additional target, the Anabaptists. But that doesn't come up in the film. When Luther's assistant arrives in Antwerp he seeks out Storm's father. Voeten Sr. accepts the printing job, even though the town's Inquisitor has already arrested another printer for producing forbidden Protestant materials. And that's when the film turns into a chase movie. The authorities catch Storm's father in the act of printing and arrest him, but not before Storm runs off with the letter's printing plate. He gets chased through the alleys and only escapes when 12-year-old street orphan Maria, and her handy sling, intervene. Now it's up to Storm to figure out how to get the letter printed, and how to save his dad. There are no language concerns, and any "sexual content" is limited to one short kiss between the two 12-year-olds at the film's end. In addition, there is quite a lot of tension. 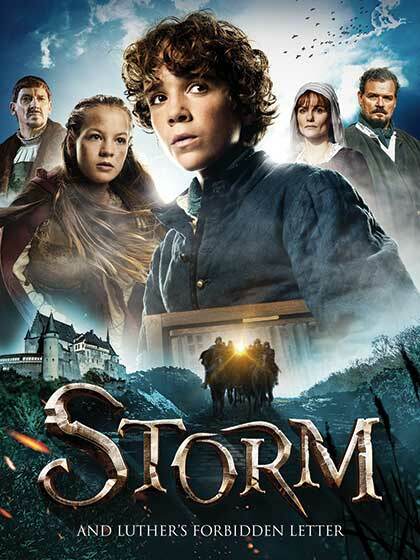 Some of it involves chases, and some of it involves not knowing what will happen next – when Storm's father is set to be burned at the stake, the young audience doesn't know that Storm will manage to save the day, and that makes this quite scary. That's why I'd say the target audience for this is probably 12 and up. The big caution with this film concerns the tension. This is more a "chase film" than a theological exploration of Luther's views, but that might just make it perfect for the younger audience it's aimed at. While the plot is a bit simple for mom and dad, the authentic 1500s setting will keep their attention. This is good, clean, even educational, fun. The film was carefully shot so that it could be dubbed into a number of different languages. If you pay attention you'll notice that the principal characters often speak with their mouths obscured in some way. Sometimes we see their mouth when they start speaking but, as they continue, the camera cuts away. That's because this was shot in Dutch, and this clever camera work means the dubbing is hardly noticeable in the English version. I can't actually find a trailer of the English version, so here below is the Dutch trailer.